Enormous plastic bag with rope draw strings that's the size of a small shopping bag. 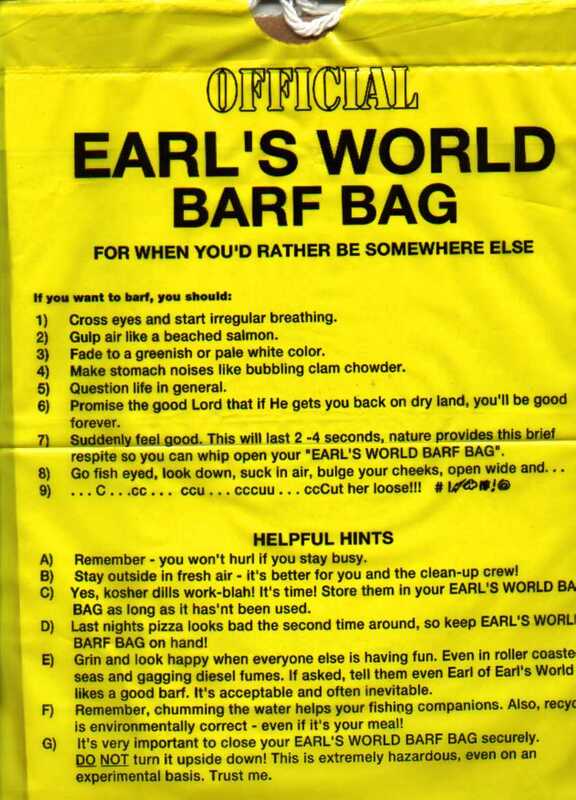 If you want to barf, this bag exhorts you to, among other things, Gulp air like a beached salmon or question life in general. 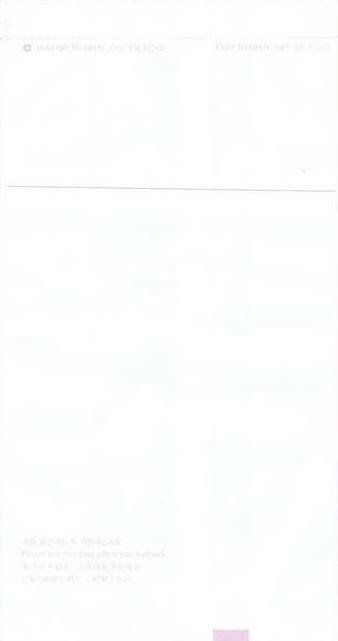 One of several helpful hints: Remember - you won't hurl if you stay busy. 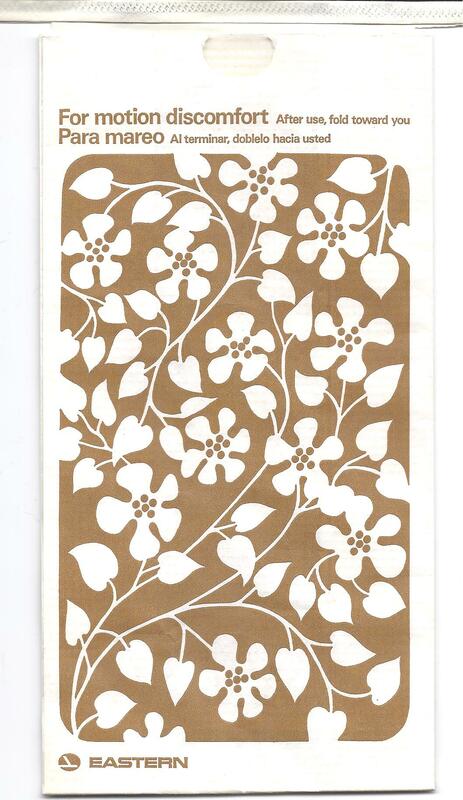 The images of this bag are big, but the download is worth the wait. 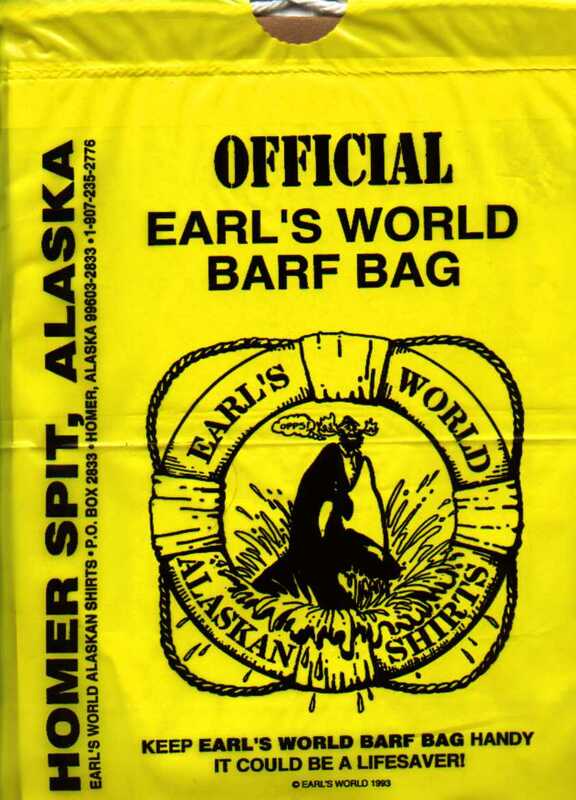 According to Bruce: A word about the Earl's World Barf Bag- The bag started out at a tee shirt shop as a lowly sack to put tee shirts in at Homer Alaska, but was also intended for use on fishing charter boats. Earl was a bit of a character in a town full of characters. He died a couple of years ago of a heart attack and the remaining bags were given to a small bush airline named Bald Mountain Air Service. 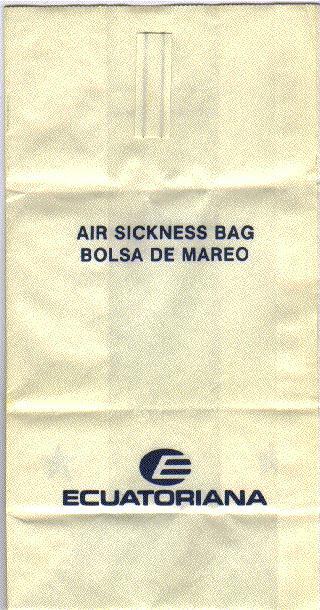 They use the bags on all their flights and to my knowledge no one else does. The logo looks like it's surfing and is about to be consumed by a huge wave. 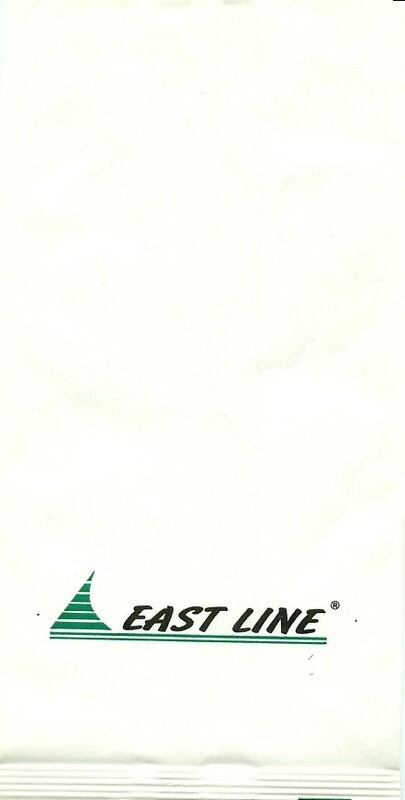 According to this bag, East Star Airlines offers Heart to Heart communications. Maybe it's more like stomach to stomach communications. Note that this bag also touts East Star's 24 hour hotline. 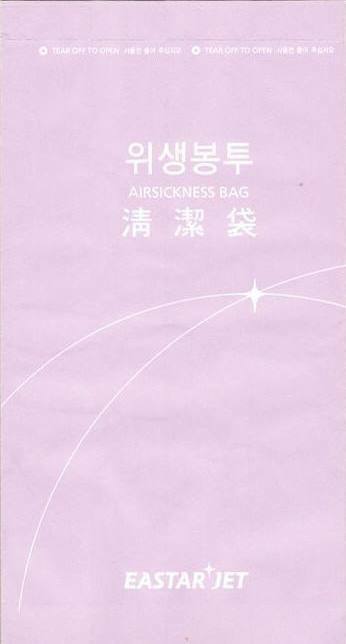 Boring South Korean bag with subtle colors. 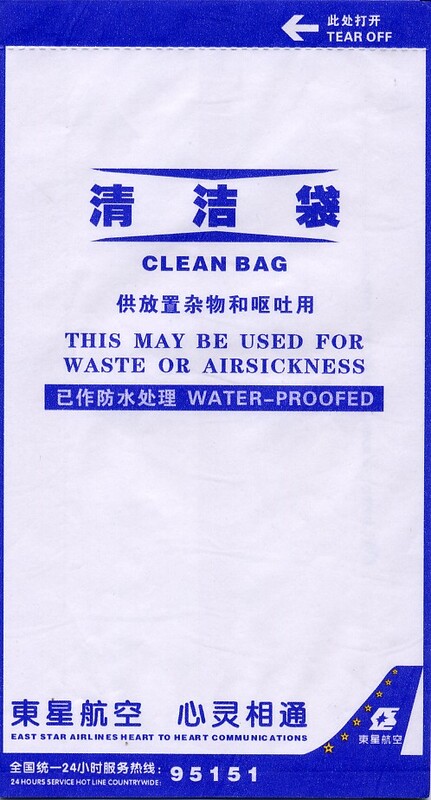 The English is actually pretty good, rare for an Asian bag. The bag is still boring, much like the prior version, except the colors are slightly bolder. They abandoned the gray bag for the purple/pink/fuschia one hoping that it adds to the Feng Shui of the seatback. 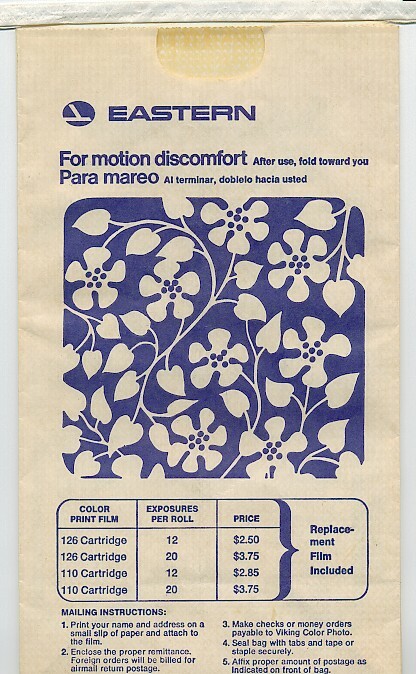 Blue Floral design on a film processing bag. When was the last time you saw either 126 or 110 film? Especially at $2.50 per roll? 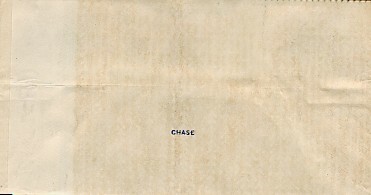 And on top of that, they send you a new roll? This bag brings back a nostalgic time when I actually had 126 and 110 cameras. And although the feeling is nice, I'm sure glad we've got digital these days. 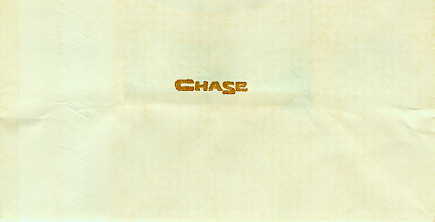 Identical to the ubiquitous 1983 bag, but the bottom says "Chase". 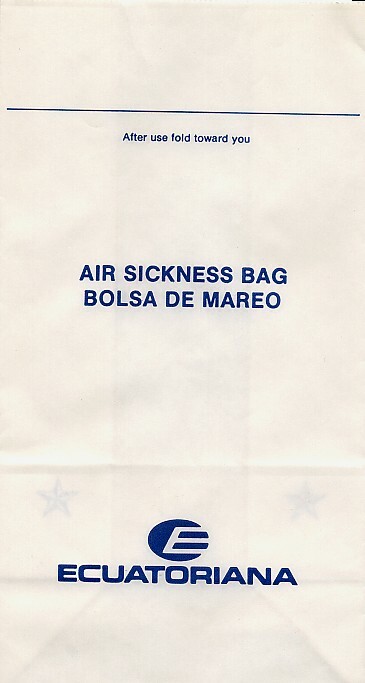 Identical to the ubiquitous 1983 bag, but the bottom says "07888-0", which I guess is a count of how many people got sick on an Eastern flight. 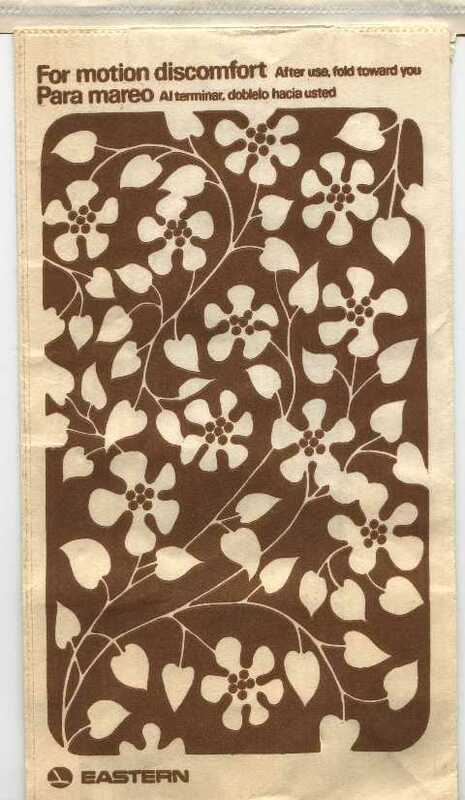 I thought for sure I had seen every type of Brown Flowery Eastern Airlines bag but I was wrong. While the design is identical to all the other bags, this one has a thumb tab and a pointy bottom instead of a flat one. Excellent bag, only the 2nd bag I'm aware of distributed by a bank. 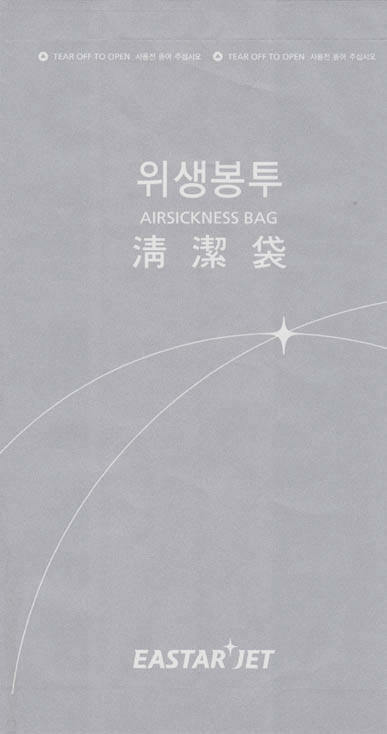 The bag shows an ostensibly sick person with the text, "Is your bank making you sick?". This bag is not only a promotional item, it's got coupons on it too! The bag continues: Bring UNUSED BAGS to one of our conveniently located branches to Get $425 with these valuable coupons. A winner of a bag. 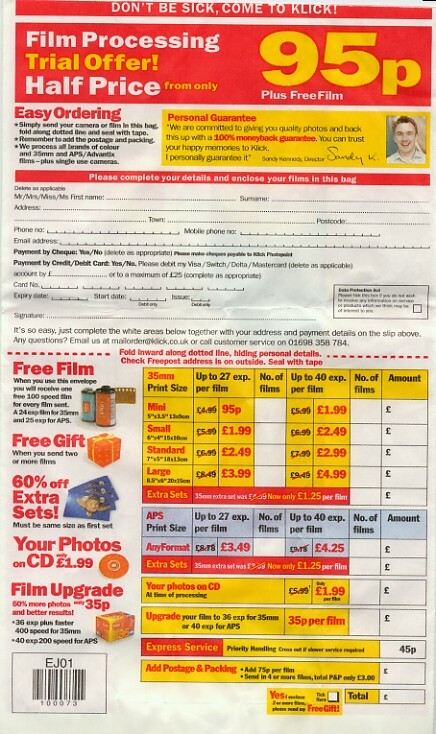 Although this film processing bag doesn't specifically say "Easy Jet" on it anywhere, the serial number near the UPC code is EJ01, probably for Easy Jet. The bag has a catchy slogan, "Don't be sick, come to Klick! 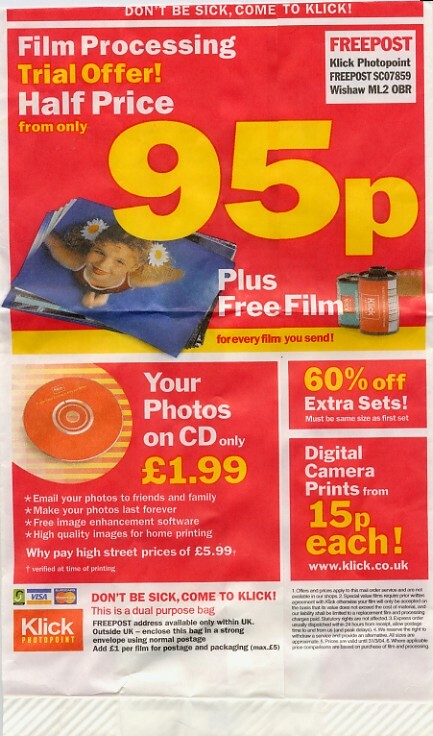 ", Klick being the film processing company. 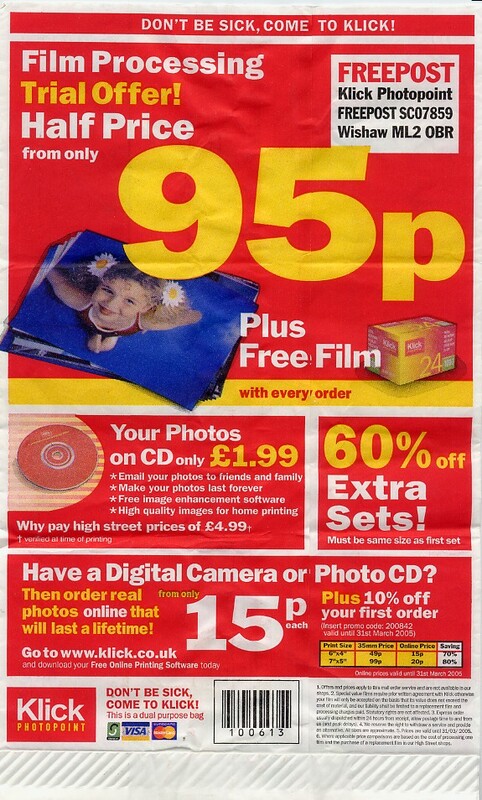 The reverse side also has the dubious phrase "Why pay high street prices of £5.99", as if they're selling crack or something. This film processing bag doesn't specifically say "Easy Jet" on it anywhere. The bag has a catchy slogan, "Don't be sick, come to Klick! 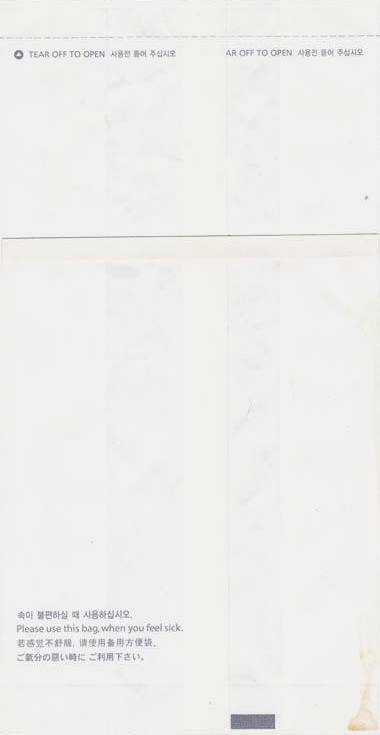 ", Klick being the film processing company. 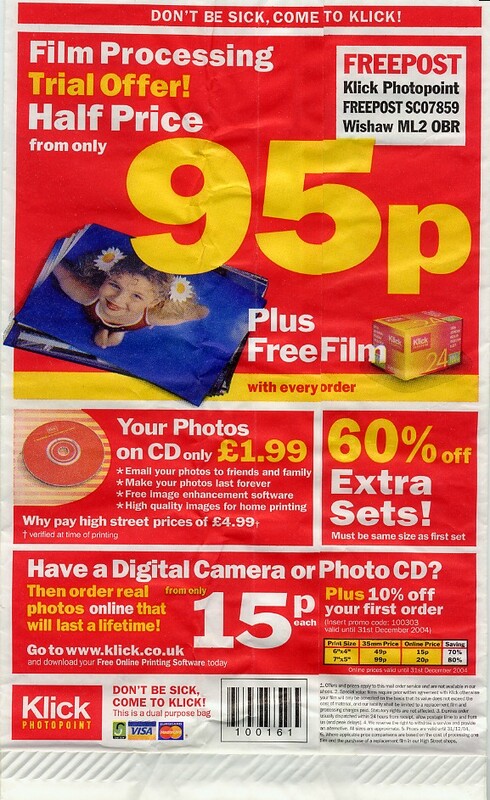 The reverse side shows that prices are only good until December 31, 2004. This film processing bag doesn't specifically say "Easy Jet" on it anywhere. The bag has a catchy slogan, "Don't be sick, come to Klick! 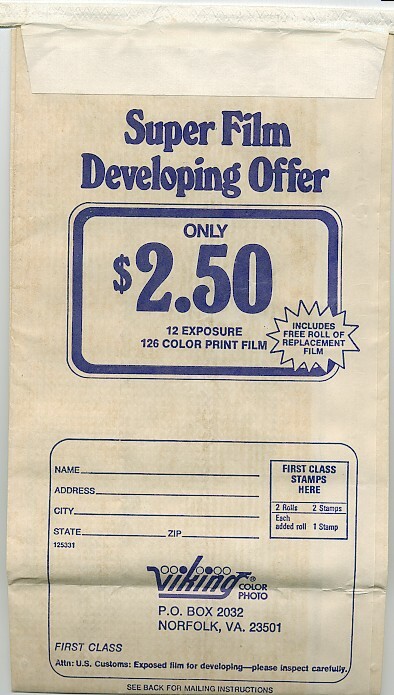 ", Klick being the film processing company. 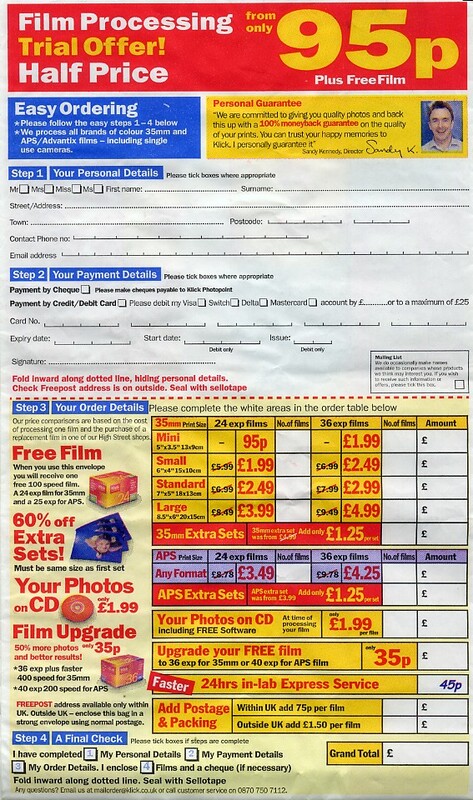 The reverse side shows that prices are only good until March 31, 2005, even though prices are identical to the previous 2004 bag. 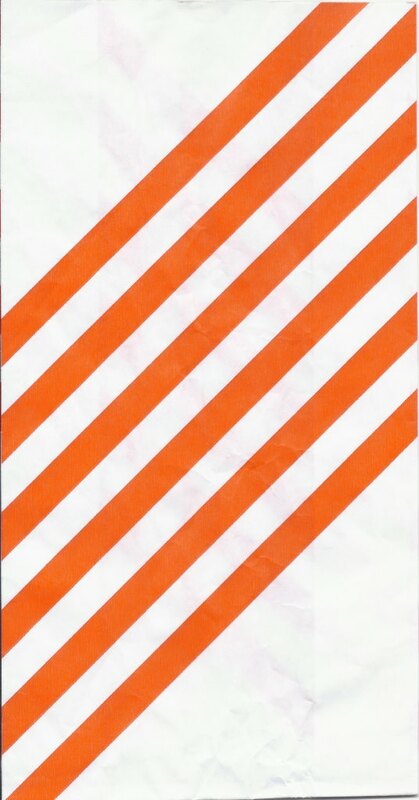 Great retro-looking bag in striped orange that is actually rather new. Could this be similar to the 1984 model that the carpeters threw out? It was so long ago, I can't remember. 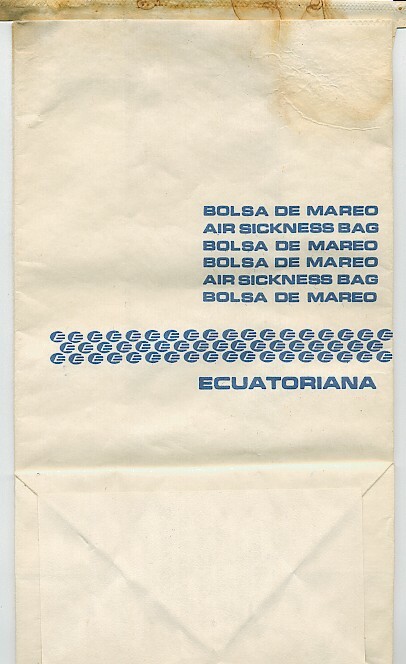 Bag comes with 53 flying E logos. Historical footnote: Dave Wilson donated a 1984 version, but the people who came in to re-carpet my residence "appropriated" it. Exactly like the other 1989 bag, except the back and front on this particular bag are identical. 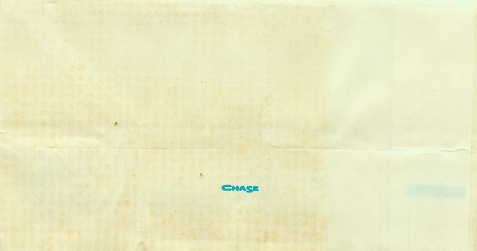 On the other bag, the back is missing a horizontal line. 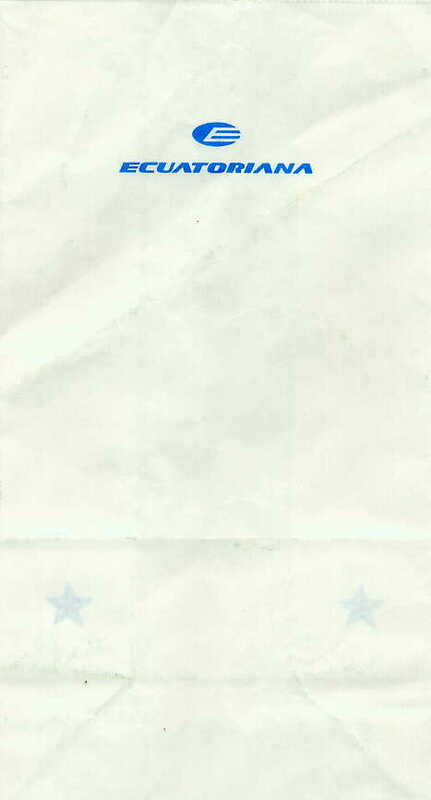 The flying E logo migrated to the top center. 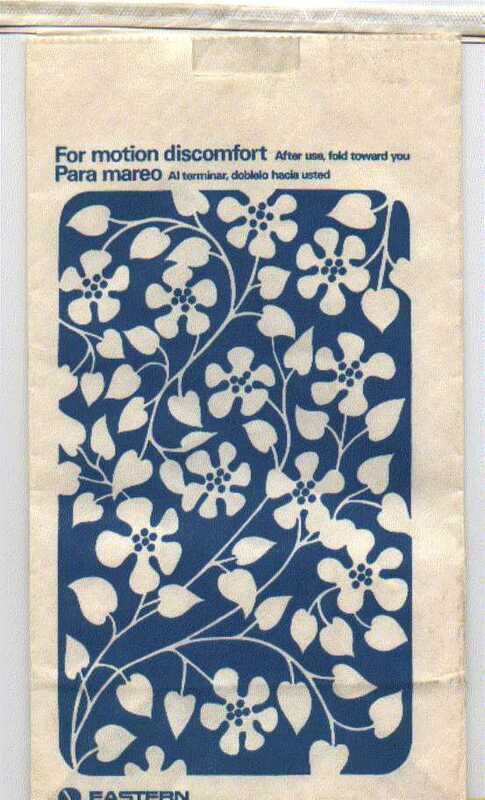 Too bad they didn't use the Escher impossible widget as the logo.